Interested in the draft Central West Small Area Plan? Join us at the “Meet the Draft Plan” meeting on Monday! “Meet the Draft Central West Small Area Plan!” meetings will be held from noon to 1 p.m. and 5 to 6 p.m. Monday, Oct. 21, in Meeting Room B at the Chapel Hill Public Library, 100 Library Drive, Chapel Hill. The public is welcome and encouraged to attend. Both meetings will be identical in format. During the “Meet the Draft Central West Small Area Plan” meetings, Town of Chapel Hill staff will provide an overview of the contents of the draft Central West Small Area Plan. After the overview presentation, there will be time for questions and answers. The Draft Central West Small Area Plan is an 80-page planning guide that provides a vision for the Central West Area in words, maps, and diagrams for future development of the area. The Small Area Plan is the result of community input received in over 10 community sessions and over 30 Steering Committee meetings that have taken place since the Town Council established a steering committee to create a small area plan for the area. The draft Central West Small Area Plan includes principles and objectives that are to guide development in the area, recommendations for bicycle and pedestrian amenities, and a Concept Plan that outlines various uses and heights for the area. The Central West Focus Area is located near the intersection of Martin Luther King Jr. Boulevard and Estes Drive and extends from Carrboro to the west, Franklin Street to the east, Homestead Road to the north, and Maple Drive to the south. For a map, please see below. 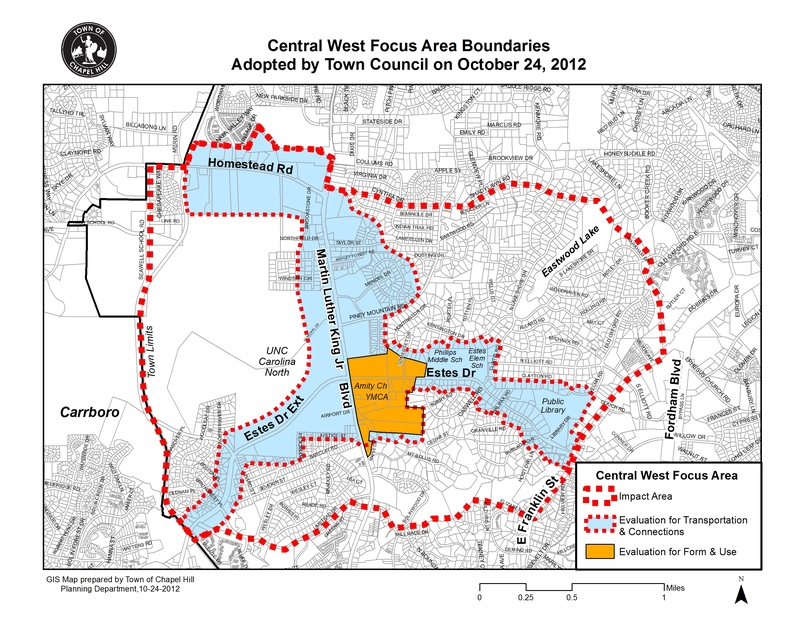 The Central West Focus Area was identified as a “future focus area” during the Chapel Hill 2020 comprehensive planning process due to the known development pressures in the area. The Chapel Hill 2020 comprehensive plan states that this area needs continued community conversation about its future and the appropriate uses (such as residential, commercial, office, mixed-use, etc.) for the area. For questions, please contact Megan Wooley, housing and neighborhood services planner, at compplan@townofchapellhill.org or 919-969-5059. Next PostMeet the Draft Central West Small Area Plan!